Chaired by Dr Arti Agrawal, the successful 23rd Optical Wave and Waveguide Theory and Numerical Modelling Workshop (OWTNM) brought together leading experts and also addressed the participation of women within the scientific discipline of optics from 16th to 18th April. From 16th to 18th April, City University London hosted the 23rd Optical Wave and Waveguide Theory and Numerical Modelling Workshop (OWTNM). Formally opened by City's Vice-Chancellor, Professor Sir Paul Curran, on 16th April, OWTNM 2015 brought together leading experts from across the globe on the modelling of photonic components and the theory of electromagnetic waves. The conference, which comes during UNESCO’s celebration of the International Year of Light, was chaired by Lecturer in the Department of Electrical and Electronic Engineering, Dr Arti Agrawal. 116 sixteen participants from 31 countries attended the annual Workshop, with nine coming from industry and 79 from academia. The main sponsors were CST Microwave and Lumerical leading firms in the production of simulation software for photonics. Seven other companies and professional bodies including the Optical Society of America (OSA) and Institute of Physics (IoP) were also sponsors. Highly relevant topics were discussed such as the way in which radioative cooling can be achieved through optics for energy conservation; defence and security applications for plasmonics and metamaterials; and how fiber lasers can be scaled up in power. Ninety-one papers - including two keynotes, eight invited talks, twenty-one contributed talks and sixty posters - were presented. These papers have been published in a book of abstracts. A special issue of the journal ‘Optical and Quantum Electronics’ will emerge from the Workshop later in the year and publisher Springer Verlag has approached Dr Agrawal to publish an edited book related to the scientific advances presented during OWTNM 2015. Free training was offered by Lumerical on FDTD technique and software, which was attended by 25 PhD and postdoctoral students. Additionally, three ‘Best Student Paper’ prizes were awarded, co-sponsored by scientific publisher Wiley and the OSA. The International Editor of Nature Photonics also attended the conference and presented the student prizes. During OWTNM 2015, there was a free ‘Women in Optics’ workshop and lunch, attended by 45 women and men featuring industry speakers addressing the topic of getting more women into the photonics industry. 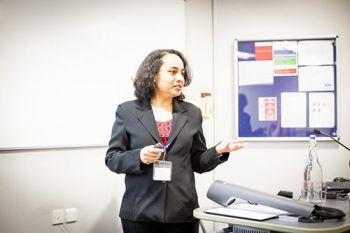 Organised by Dr Agrawal and opened by Pro Vice-Chancellor for Research and Enterprise, Professor John Fothergill, the workshop was co-sponsored by the Institute of Physics (IoP) and the IEEE Photonics Society. Participants came from the UK, Poland, Greece, Spain, India and China. Professor John Fothergill addressed the mixed messages communicated to young people about what girls and young women can and cannot do and mentioned the popular misconception that “boys build Lego and girls play with dolls”. He stated that these mistaken ideas negatively impact the perception of science, technology, engineering and mathematics (STEM), with fewer girls taking up science and engineering. This led to a discussion on the importance of attracting young girls into STEM and supporting women throughout their careers. The workshop focused on career options in the discipline of photonics within industry and academia. Presentations from Rosie Cush (Oclaro) and Sally Day (University College London) included career advice and increasing female participation. There was a lively debate over lunch and after each talk about avenues for women to enter STEM professions and do well and what can be done to let people know about the changing face of industry. The discussion included the role of professional bodies in encouraging women in STEM careers and the channels through which volunteering can help to develop skills, get recognition, create networks and ultimately shape the environment that women operate in. The OWTNM 2015 social programme included a welcome reception on 16th April, a gala dinner on board retired Navy warship vessel HMS President and a traditional “fish and chips” supper on the 18th. Delegates thoroughly enjoyed the opportunity to mingle with each other in a relaxed and informal atmosphere. Photonics is the science and technology of generating, controlling, and detecting photons, which are particles of light. Photonics underpins technologies of daily life from smartphones to laptops to the Internet to medical instruments to lighting technology. The 21st century will depend as much on photonics as the 20th century depended on electronics.